Few network and IT managers look forward to migrating critical systems and solutions from one vendor to another, but it is often an essential step forward when evolving operational requirements are considered. When migration is viewed as an opportunity, the new benefits and broad range of quantifiable advantages realized can make switching vendors the optimal solution. 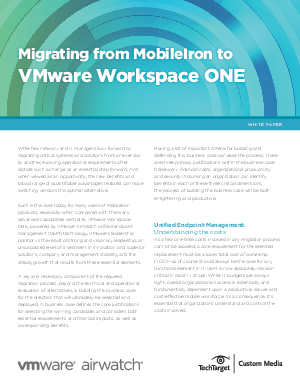 Read this Tech Target whitepaper to learn more and see why now is the best time to migrate from MobileIron to VMware Workspace ONE, powered by VMware AirWatch unified endpoint management (UEM) technology.